How long does a lesson take in my LSAT course? Should I complete a pre-recorded lesson in one sitting? Can I stop a lesson and return/resume? Each online lesson is about 3 hours long. The amount of time you spend on a lesson will vary, depending on how long you spend working though the accompanying questions in the course books and how much time is spent reviewing lesson material. That said, the Online Anytime lesson videos are designed to be flexible and fit your schedule, so you can complete them at whatever pace works best for you. You can complete a lesson in one sitting. Just be sure to take breaks and take as much time as you need to feel confident in your understanding of the concepts covered. You can also pause a lesson and return later on. 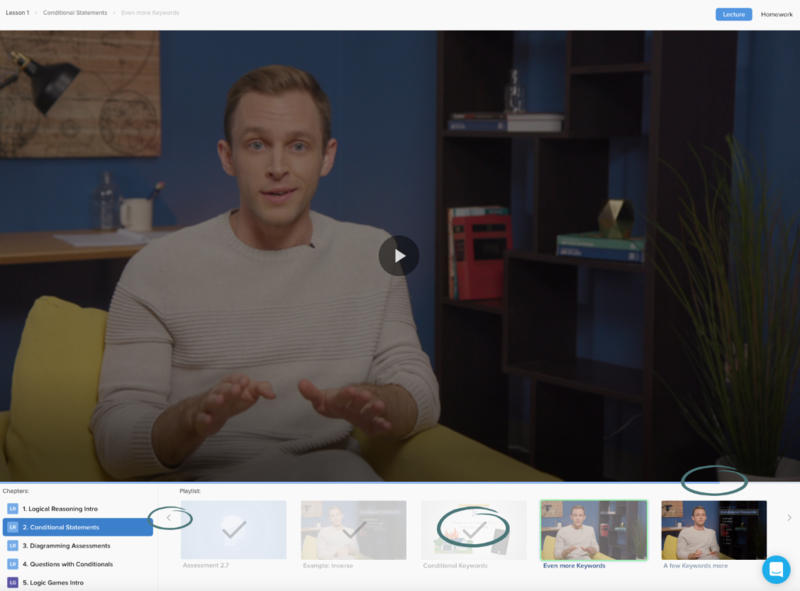 Lesson videos automatically save your progress, so you can see which videos you have already completed and where you left off. Since each lesson is split up into several videos, it's easy to stop at the end of one video and pick up with the next one whenever you are ready. On each lesson page, you can tell which videos are in progress or have been completed by checking the chapter playlist below the current video to see each video thumbnail at the bottom of the page. Once you complete a video, the thumbnail will grey out and be checked off, so you can easily tell which sections are remaining. If you don't see past videos in that chapter, just click the side arrows to go back. The progress bar located just below the video will mark how far you've made it through the chapter. * Do your online lesson videos look different? You may be enrolled in our previous, pre-2019 curriculum! Some hints that you may be: you'll see 16 lessons and our founders Trent and Matt talking! In this case, your lessons are 4 hours long, but similar principles apply.